Come for the impossibly thin chassis, stay for the stellar display! 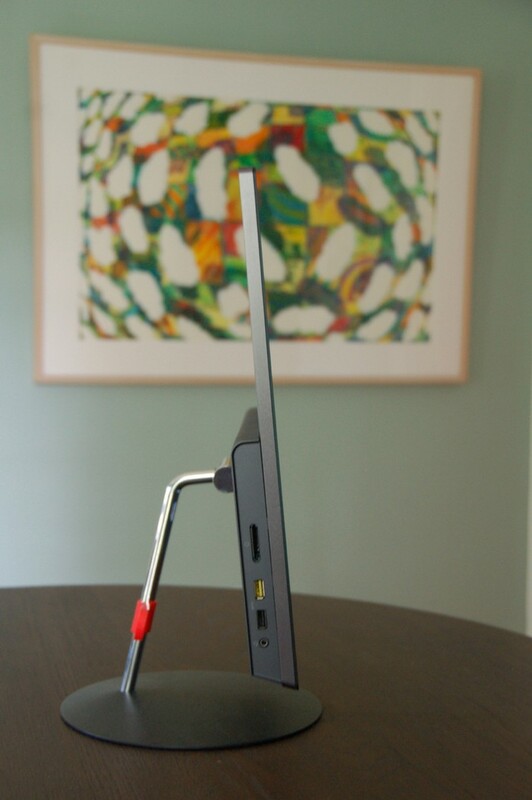 It takes just one look to figure out the chief attraction of the Lenovo ThinkPad X1 all-in-one (AIO) PC: the body. This super-slim desktop, previewed at CES 2016, has an ultra-thin aluminum-alloy chassis that measures less than half an inch thick at its thinnest point. 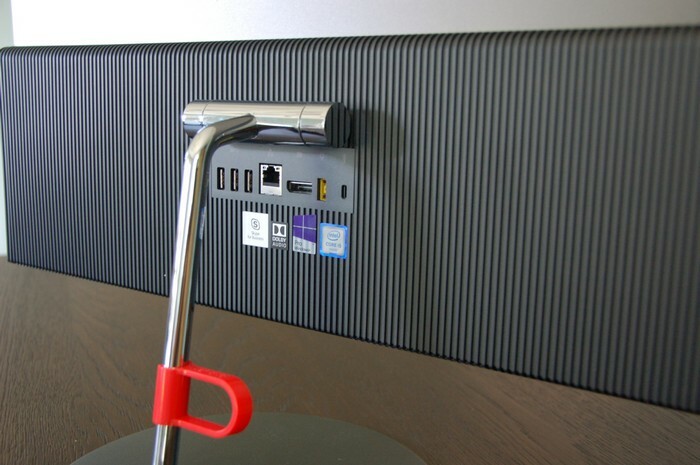 The system’s stand and neck are also elegant, lending a minimalist look to the machine that makes it a good fit for cramped cubicles and high-traffic reception areas alike. While the ThinkCentre X1 is undeniably sleek, the display is likely to become your favorite aspect of the system once you&apos;re looking at it head-on, rather than edge-on. The 23.8-inch display features a somewhat pedestrian 1,920x1,080 full HD (FHD) resolution and no touch support, but two things make it stand out. For one, it’s an in-plane switching (IPS) panel, which means it offers wide viewing angles and excellent color reproduction. Second, it features one of the best anti-glare coatings that we’ve encountered on an AIO. It produces a crisp, vibrant image even under bright artificial light or direct sunlight. This display will look outstanding no matter how harsh the fluorescent lights are in your office, or how bright your sunny corner office gets. The Core i5-6200U is a highly efficient mobile CPU with a TDP of only 15 watts, typically seen in thin laptops and ultrabooks. The very low TDP means that the chip needs only minimal cooling, and Lenovo has redesigned the fan blades of the cooler it used here so it spins at a whisper. Until we learned about the redesigned cooling fan, we thought the system was fanless. That&apos;s because it operates in what seems like complete silence, until you get an ear very close to the back panel. The component lineup is a fairly basic midrange selection. You can find similar or better performance for less; the ThinkCentre X1’s thin design is what demands a premium. The HP Pavilion 23-q019 All-in-One$657.97 at Amazon and Lenovo IdeaCentre AIO 700$974.59 at Amazon all-in-ones, to name two we tested of late, offer better component loadouts and bang for your buck. What they lack, however, is the ThinkCentre X1&apos;s luxuriously thin design and very quiet operation. A simple analogy: Ultraportables are to laptops what the ThinkCentre X1 is to other all-in-one desktops. 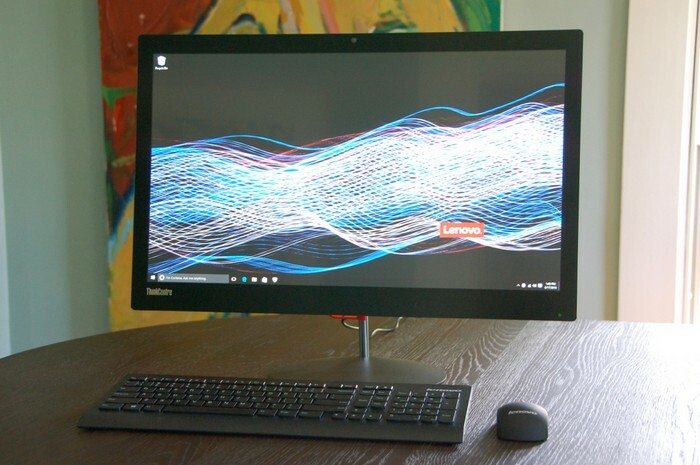 The ThinkCentre X1 puts design at the forefront, resulting in a sleek, snappy-looking system. It&apos;s a great fit for those shopping for an all-in-one for a cramped desk or, more likely, a high-profile, high-traffic spot such as an office&apos;s front reception area. The system&apos;s front face is a sheet of edge-to-edge glass, creating a seamless, clean front that is sure to impress both users and bypassers. 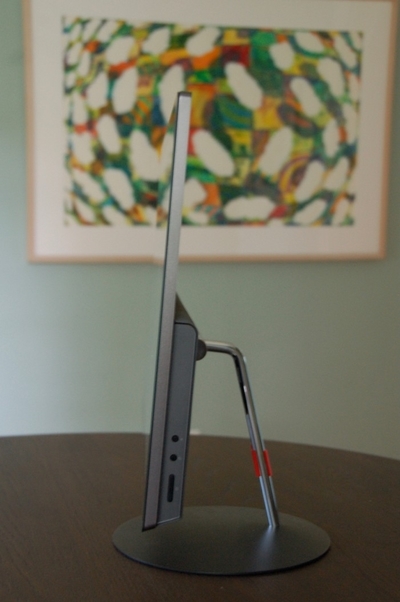 From the side, the system impresses with its unusually thin design. The top half of the system measures only 0.43 inch thick. The bottom half houses the system components and still measures only 1.3 inches thick. 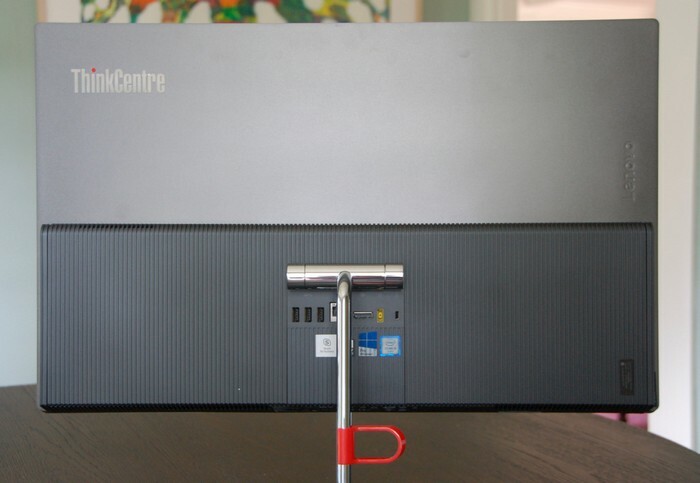 The ThinkCentre X1&apos;s thin design is paralleled by an ultra-light weight. It weighs just 11 pounds, which makes the system easy to tote from one desk to another. 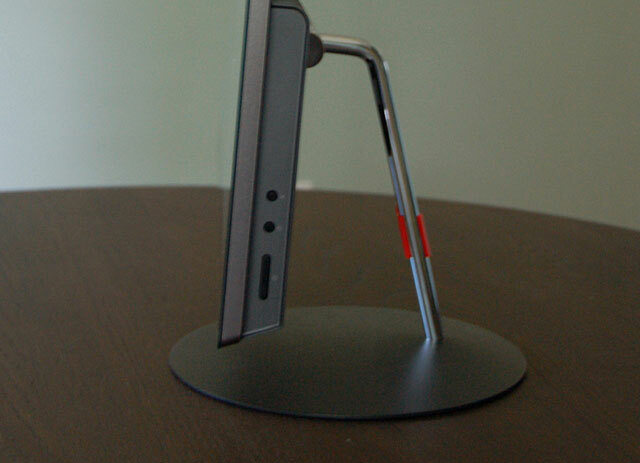 More important, the lack of weight in the screen portion allows for an elegant, minimal stand. The base of the stand is a simple round disk 9.5 inches in diameter, and a thin, chrome arm holds the display in place. This is a design that will turn heads and start conversations. One more note on the power cable: The system’s thin design leaves no room for an internal power supply, so a small power brick resides inline on the power cable. If you plan to place the ThinkCentre X1 in a high-profile spot, you’ll need to figure out a way to hide the power brick so it’s not resting awkwardly next to the otherwise sleek system in your reception area. At the heart of the system is the 23.8-inch display. It’s not a 4K display, and it doesn’t offer touch support, but despite these two omissions, it’s still a super screen. For starters, the IPS nature of the panel results in wide viewing angles and accurate color reproduction. With a 1,920x1,080 resolution, the image is crisp and bright, and our standard test images exhibited accurate skin tones and vibrant colors. A big surprise was the edge-to-edge glass covering the display and screen bezel: Its anti-glare coating was among the best we’ve seen at combating glare and reflections. A pair of 3-watt JBL stereo speakers produce passable audio. Volume reaches a level that can fill a small room or office, but bass response is lacking. The system’s audio will suffice for video conferencing and watching videos, but don&apos;t count on it for satisfying music playback except in a pinch. A 2-megapixel, 1,080p Webcam produces a fairly sharp picture for video conferencing, and when you’re aren’t using the Webcam, you can slide a privacy block over the lens to eliminate any possibility of unexpected transmissions. The ThinkCentre X1 offers ports aplenty, with one exception: The system features a DisplayPort connection on the back panel instead of an HDMI port. A button on the right edge lets you toggle between DisplayPort-in and -out. This lets you use the ThinkCentre X1&apos;s excellent screen as a provisional stand-alone monitor when you&apos;re not using the "PC portion" of the AIO. But we&apos;d have preferred this to be an HDMI-in, for connections to typical consumer electronics devices like gaming consoles or disc players, which strongly favor HDMI. Also on the right edge is a mute button for the microphone, plus the power button. On the back panel, in addition to the DisplayPort, you’ll find three USB 3.0 ports, an Ethernet jack, the power connection, and a cable-lock security slot. On the left edge are two more USB 3.0 ports, a flash-media card slot, and a headphone/microphone combo jack. Lenovo bundles a wireless keyboard and mouse with the ThinkCentre X1. The full-size keyboard features a dedicated number pad and flat, if slightly mushy, keys. The laser mouse is undersized and ambidextrous in design, but it has a pleasing heft to it. While they&apos;re no match for a decent aftermarket keyboard/mouse set or a mechanical keyboard, the X1&apos;s peripherals are a bit better than the standard grade of AIO-bundled input devices. Our $1,079 testing configuration of the Lenovo ThinkCentre X1 featured the 6th-Generation (“Skylake”) Intel Core i5-6200U CPU we mentioned earlier. An ultramobile-grade chip, it employs two cores and four threads via the Hyper-Threading feature. Its base clock speed is 2.3GHz with a maximum turbo frequency of 2.8GHz. The system’s other specs include 8GB of DDR4 memory, a 256GB SATA solid-state drive, and integrated Intel HD 520 graphics; the last is part of the Core i5 chip. 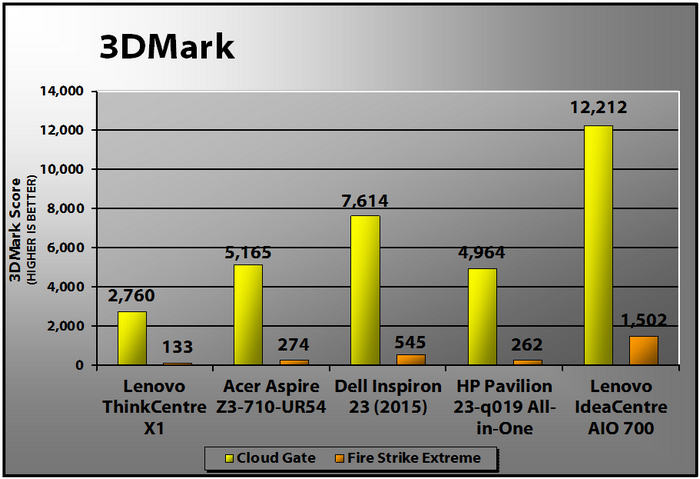 For our benchmark charts, we matched the ThinkCentre X1 against another "Skylake" Core i5-based all-in-one from Lenovo, the IdeaCentre AIO 700$974.59 at Amazon, and two 4th-Generation Core ("Haswell") i5-based all-in-ones, the Acer Aspire Z3-710-UR54 and the HP Pavilion 23-q019 All-in-One$657.97 at Amazon. Rounding out the charts is the Dell Inspiron 23 (2015)$1,169.00 at Amazon, which featured a 4th-Generation Core i7 chip and a now-seldom-seen AMD Radeon HD 8690A graphics processor. The only other AIO in this lot with a dedicated graphics chip was the IdeaCentre AIO 700, which had a similarly modest offering, the Nvidia GeForce GTX 950A with 2GB of graphics memory. All the others rely on the Intel HD Graphics integrated into their CPUs. 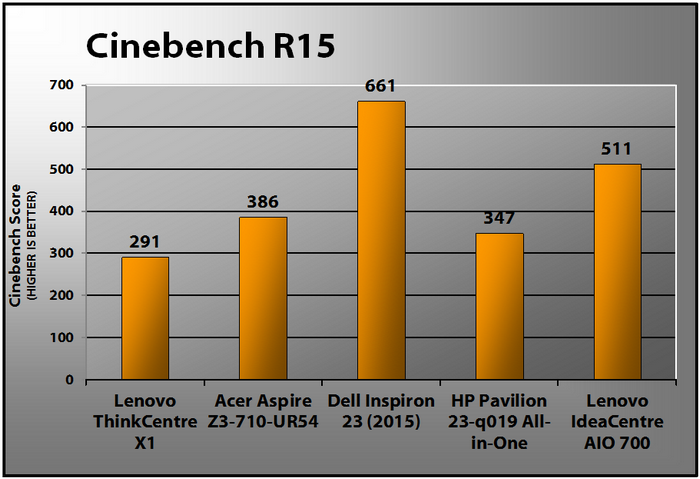 The ThinkCentre X1’s 6th-Generation Core i5 is the most efficient CPU of the bunch, with the lowest TDP of them all (as mentioned, only 15 watts). The other four systems range in TDP from 37 watts to 65 watts. This processing-efficiency advantage lets the ThinkCentre X1 churn away in silence even when heavily stressed. We started our testing with PCMark 8. It&apos;s a holistic performance suite developed by the PC benchmark specialists at Futuremark. It contains several presets that simulate different real-world productivity and content-creation workflows. We use the Work Conventional scenario to assess overall system performance for office-centric tasks such as word processing, spreadsheeting, Web browsing, and videoconferencing. The test generates a proprietary numeric score; higher numbers are better. 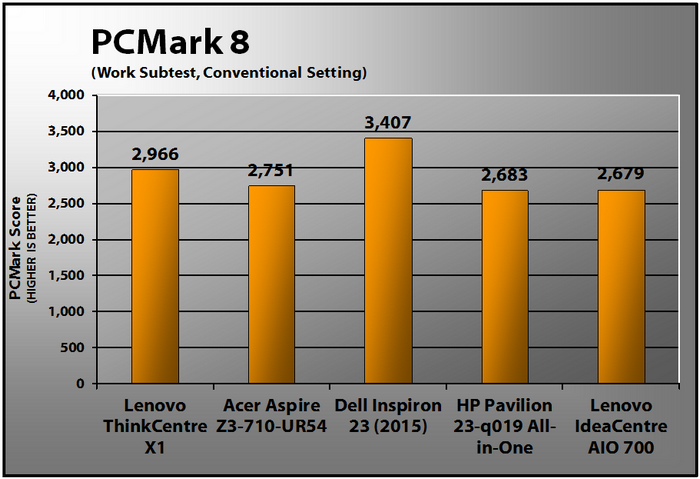 The ThinkCentre X1 posted a positive result on PCMark 8, besting the Core i5-based systems and trailing only the Core i7-based Dell Inspiron 23. In anecdotal testing, the ThinkCentre X1 handled the multitasking of basic office tasks with ease and was able to run Chrome with dozens of open tabs without issue—nor any fan noise. Next is Maxon&apos;s CPU-crunching Cinebench R15 test, which is fully threaded to make use of all available processor cores and threads while using the CPU rather than GPU to render a complex image. 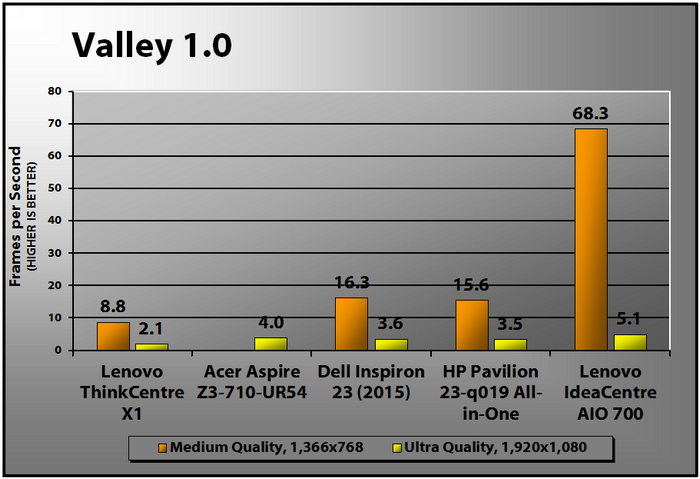 The result is a proprietary score indicating a PC&apos;s suitability for processor-intensive workloads. The ThinkCentre X1 struggled on Cinebench, falling to last place. On this more specifically CPU-intensive test, the processing efficiency of its low-voltage Core i5-6200U reveals the price it exacts in performance. Cinebench is often a good predictor of our Handbrake video-editing test, another tough, threaded workout that&apos;s highly CPU-dependent. In it, we put a stopwatch on test systems as they transcode a standard five-minute clip of 1080p video (Pixar&apos;s short Dug&apos;s Special Mission) to a smartphone-friendlier format. Because this is a timed test, lower results are better. Cinebench, indeed, foreshadowed this result. 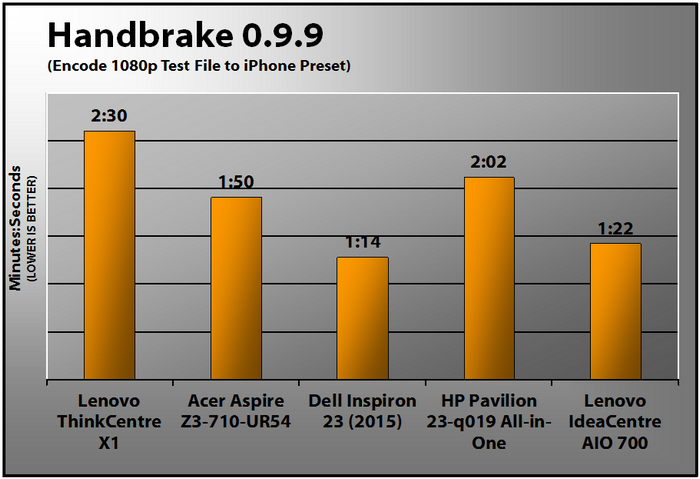 The ThinkCentre X1 finished Handbrake well off the pace of the others, bringing up the rear again. 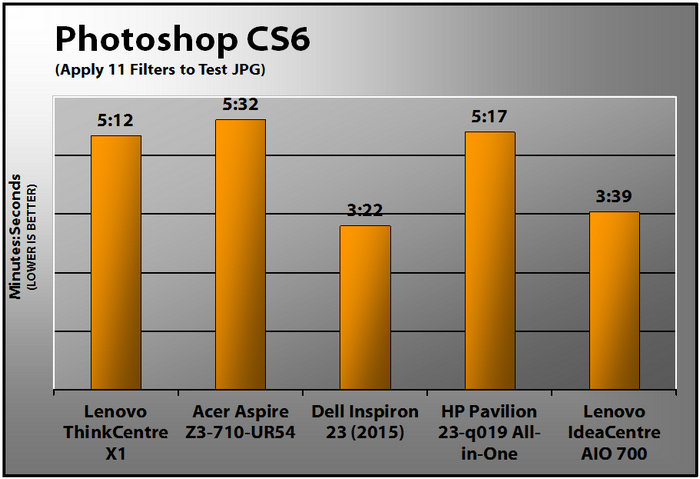 We also run a custom Adobe Photoshop image-editing benchmark. Using Photoshop version CS6, we apply a series of 11 complex filters and effects to a standard JPEG test image. We time each operation and, at the end, add up the total execution time. As with Handbrake, lower times are better here. 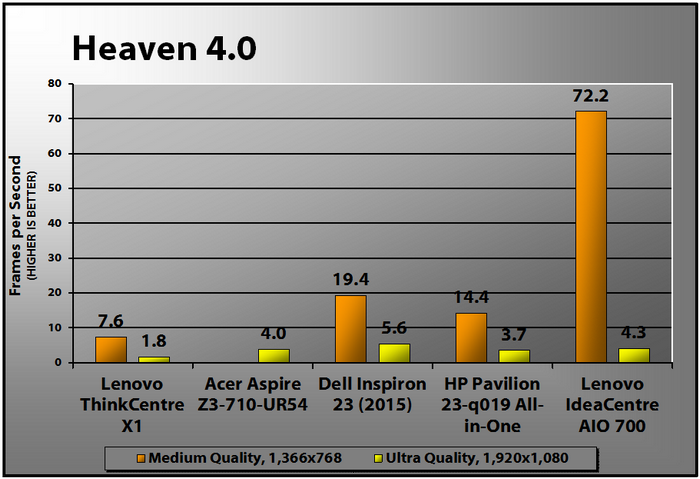 The ThinkCentre X1 climbed out of the basement on our Photoshop test, finishing in the middle of the pack, ahead of both of the "Haswell" Core i5-based systems, the Acer Aspire Z3-710-UR54 and the HP Pavilion 23-q019 All-in-One. We strongly suspect the SSD boot drive helped here. Our first graphics test is Futuremark&apos;s 3DMark, which measures relative graphics muscle by rendering sequences of highly detailed, gaming-style 3D graphics that emphasize particles and lighting. The low-resolution Cloud Gate preset (meant for entry-level PCs) isn&apos;t much of a challenge for today&apos;s systems, but the Fire Strike Extreme preset makes even high-end gaming systems break a sweat. For a system like the X1, the Cloud Gate results are the only ones really relevant. The ThinkCentre X1 trailed not only both systems with dedicated graphics but also the two systems with previous-generation integrated Intel graphics. Again, the premium placed on efficiency leaves the ThinkCentre X1 in last place. The integrated Intel HD 520 graphics of the Core i5-6200U processor has a lower base frequency than the older graphics chips that are clocked a bit higher but with greater power consumption. Next come two grueling DirectX 11 gaming simulations, Heaven 4.0 and Valley 1.0. Unigine&apos;s popular tests push graphics processors to the limit in complex flyovers of a skyborne steampunk village (Heaven) and a stormy nature scene (Valley), both filled with particle and lighting effects. We test systems at medium image-quality settings at 1,366x768 resolution and again at top or ultra quality settings at 1,920x1,080 resolution (for desktops) or native screen resolution (for laptops). Note that the Acer AIO below didn&apos;t support the 1,366x768 setting, thus its missing bars. The meager frame rates the ThinkCentre X1 served up on Heaven and Valley were nowhere close to the minimum 30 frames per second needed for smooth gameplay and show that system is a poor fit for gamers looking to play recent AAA games. Sleek and silent, the ThinkCentre X1 is a great choice for running basic office tasks and doing it in style. You’ll pay a bit of a premium for its design, but you won’t notice the performance penalty unless you engage in media-editing and -creation tasks, or are a very heavy multi-tasker. For general operations in Windows, it felt speedy and responsive. Opting for the SSD boot drive that was in our test unit, we are certain, was responsible for a large part of the pep. The display would look even sharper and provide a larger "effective" workspace if it were a 4K display, and some reception areas might require touch-input support for visitors. (Say, if a business intended to use this unit for custom input applications, such as digital sign-ins at a doctor&apos;s office.) But we were more than satisfied with the 1080p IPS panel for actual productivity work. At only 23.8 inches, its 1080p resolution presents a crisp image; for a 27-inch or larger display, we might suggest looking at 4K options. And the anti-glare coating on the ThinkCentre X1 is one of the most effective at keeping glare and reflections at bay. With an ultra-thin chassis, a space-saving base, an elegant display arm, the ThinkCentre X1 cuts a pretty profile. If you&apos;re a design-conscious shopper willing to spend a bit for a luxurious look, the ThinkCentre X1 deserves a spot on your short list. That it operates practically in silence is an added bonus in crowded cube farms or other places where operating noise matters.